The Barrett girls on bikes. So far in our series, we’ve discussed trailers, trail-a-bikes, and tandem options for kids, but what about when they are ready to ride on their own? Typically by the age of four, kids are ready to ride a two wheeler. It is tempting to get them something they can “grow into”, but a smaller wheeled bike will make learning much easier. There are a few other options that can make learning much easier. Training wheels certainly help kids grasp the idea of pedaling and steering without the stress of learning to balance at the same time. The drawback is that kids can become so used to having the extra wheels that they have a hard time adjusting to riding without them. Strider style bikes (a.k.a. 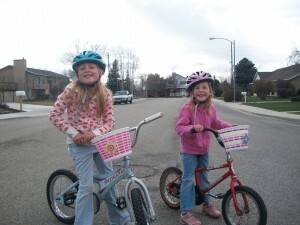 “pre-bikes”) without pedals or cranks are another option that teaches the basics of balance and steering. Usually kids are familiar enough with pedaling, thanks to big wheels, that it’s a pretty easy jump from these to a two wheeler. A similar option that we tried with one of our kids was just taking the pedals off her bike and lowering the seat and letting her scoot around on it. I didn’t really think it was working and she asked that the pedals be put back on…and promptly rode away. Not sure whether it was the scooting or if it was just her time to ride, but it worked! I’ve also found Razor style scooters help kids grasp the balance and steering and make an easy transition to bicycling. This was how our other daughter learned to ride and she also only had a couple bobbles before riding on down the road. I’ve heard of younger kids riding, but both of my girls learned to ride at four. It wasn’t really planned, they just seemed ready and willing and took to it pretty easily. What is important is that when they are learning to ride, they have a quiet area to practice, like a parking lot after hours or a cul-de-sac. A first bike need not be fancy, but make sure that it is in good working order. This is one place where it pays to buy their bike from a bike shop. As mentioned in a previous article, would you buy YOUR bike at Big Box Mart? The number of bikes I have seen with the forks installed backwards or the brakes not functioning properly is enough to make that decision easy. A helmet and close-toed shoes are the other requirements. Sandals seem easy, but after seeing my sister get her toe stuck between the chain and chainring, I always opt for close-toed shoes! Yes, some kids bikes have chain guards, but it’s still really easy for a kid to drag their toe when learning, so you might as well have ‘em covered. Soon enough, they will want to go ride on their own for their first tastes of freedom. As with everything else in life, kids follow your example, so be sure that before they take off riding on their own, you lay down the basic “road rules” for safe cycling. And more importantly, you should obey those rules on your rides together. As when you cross the street as a pedestrian, don’t be afraid to exaggerate complete stops for their benefit. And of course, wear a helmet! They are always watching what you do!